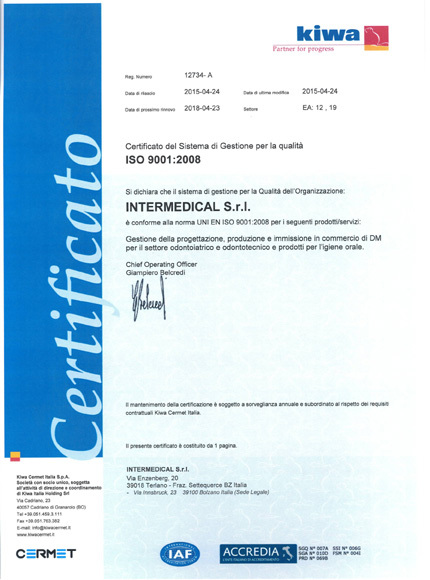 Providing high-quality products is one of the main goals of Intermedical S.r.l. 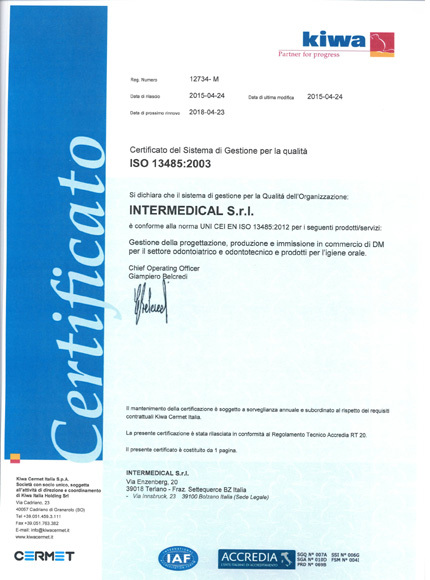 Continuous improvement in processes and in product quality is part of the "corporate mission" of Intermedical S.r.l. Providing safety to our customers and end users is a key priority. For this reason, Intermedical daily invests its resources to streamline processes and ensure the highest product standards. The quality management system fully meets the requirements of standard ISO 13485:2012 for the design and production of Medical Products (CE). This certification is a guarantee of clear procedures that identify each stage of production, which as such is streamlined, effective and efficient, and able to respond to market demands in terms of quality and innovation. All products released in the market have passed strict internal and external quality control tests that certify their compliance with the applicable laws and regulations. The manufacturing plant meets the most stringent standards when it comes to the safety and quality control of production. Moreover, the Company is certified according to international standards ISO 9001:2008. The content of the website www.intermedical.dental is reserved to healthcare professionals and contains information about products that may cause a hazard to the health and safety of the patient if not properly read, understood and applied by a professional. In accordance with the applicable laws and regulations, I declare under my own responsibility that I am a medical, dental or dental-technology industry professional and that I am authorised to view the content contained in this website.